A Republican Senate primary in Arizona featuring three major contenders is shaping up to be the preeminent test of Trumpism in the 2018 midterm election cycle. This week's entries of former Maricopa County Sheriff Joe Arpaio and Rep. Martha McSally into the race to replace retiring GOP Sen. Jeff Flake has scrambled the prospects of Kelli Ward, the former state senator and physician who already has been running for 15 months. Ward, who'd been leading in polling in a matchup against Flake, suddenly finds herself squeezed between Arpaio – an immigration hard-liner with a devoted national following and a relationship with President Donald Trump – and McSally, the retired Air Force colonel and Harvard-educated choice of mainstream and elite Republicans. Ward's pathway to victory was predicated on her ability to consolidate conservatives. Having to now compete for those voters with Arpaio, it's McSally who looks to benefit from the breach on the right. An OH Predictive Insights poll conducted this week of 504 registered voters found McSally with 31 percent support to Arpaio's 29 percent. Ward, despite having the longest tenure in the race, was in third with 25 percent. A November poll by the same firm pegged Ward at 42 percent support to McSally's 34 percent in a two-person contest. "Sheriff Joe's entrance into the race probably assures Martha McSally the nomination," says Bruce Ash, a Republican National Committeeman from Arizona. "It probably splits the vote on Kelli Ward. The primary is probably a little more certain for Martha with Sheriff Joe's entry." Adds a GOP lobbyist in Phoenix: "This kind of kills Ward. If you're hard-line on immigration, you're going to go with Joe. If you're a [former U.S. Sen.] Jon Kyl-establishment Republican, you're going to go with McSally." In response to the reshuffled political playboard, Ward has chosen to play nice with Arpaio while shivving McSally, who formally launched her campaign Friday on conservative host Hugh Hewitt's radio show ahead of a statewide tour. Dubbing her "Jeff Flake 2.0," Ward, 48, laced into McSally during an appearance on a Tucson radio station Wednesday, describing the second-term congresswoman as a pretender, an opportunist and part of the dreaded Washington establishment. "She was [Sen. John] McCain Jr. and Flake Jr.," Ward said on KNST-AM. "McSally did not support President Trump. She refused to say who she voted for in the presidential election." "I talked to somebody from her campaign and what he told me – and it's very sad – is that Martha sees an opportunity in this race and she's looking for her next big thing. Well, guess what? I'm looking for the future of our country, for the future of our children, for the future of our grandchildren – not the next big thing for Kelli Ward. It is appalling to hear someone say that," she continued. When asked by host Garret Lewis about Arpaio, Ward was laudatory, calling him a "patriot" and praising his leadership on working to stop illegal immigration. The furthest Ward would go in sketching a contrast was to gently frame herself as a more rounded candidate than Arpaio, who is almost wholly defined by a single issue. Then, she turned back to McSally. "Actually, she has a worse voting record than Sen. Flake and Sen. McCain," Ward said. "She's dismal. I don't want dismal." Notably, the website FiveThirtyEight pegs its calculation of how often McSally votes in line with Trump's positions at 96.7 percent, compared with Flake's 90.7 percent score and McCain's 83 percent tally. To counter McSally's announcement tour, the Ward campaign is launching a digital advertisement that will advance to cable television next week. It outlines a spree of McSally's critiques of Trump. "McSally questioned Trump's character, refusing to endorse him and leaving open the possibility of voting for Hillary Clinton," a narrator in the 60-second spot says. "After his inauguration, McSally continued to undermine our president." The 85-year-old Arpaio, who lost his 2016 re-election bid for sheriff after being indicted for criminal contempt of court, is presenting himself as an avatar of Trump. Arpaio was one of Trump's earliest supporters, endorsing him a week before the Iowa caucuses, and the president returned the loyalty by pardoning Arpaio of his conviction for disregarding a court order on how to police illegal immigration. 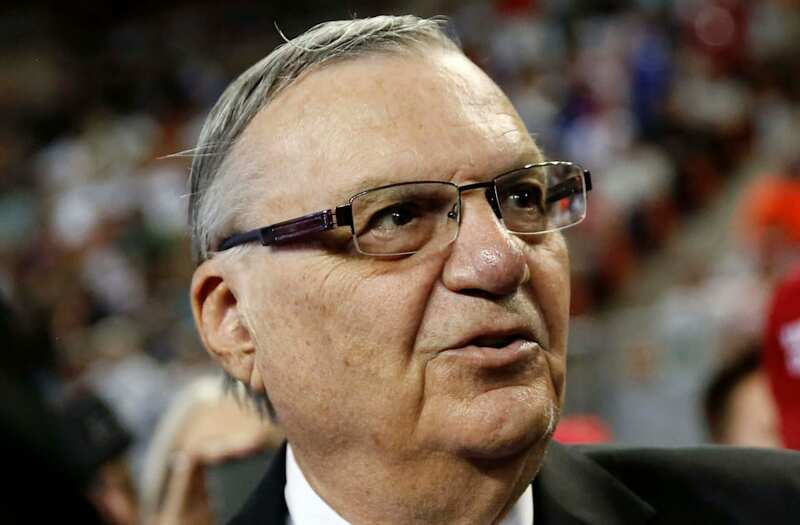 Arpaio surprised the political class with his decision to pursue the Senate seat. In doing so, he undercut Ward's ability to distinctly tie herself to the president, and he shows no signs of his loyalty to Trump waning. For example, after Trump reportedly denigrated some nations as "shithole countries" in a meeting with lawmakers Thursday, Arpaio dismissed the fury on MSNBC, saying, "I support him regardless of what he says." The Arpaio campaign is also promoting the president's effusive praise of the former sheriff, even though Trump hasn't issued a formal endorsement in the race. "Kelli has been running for a U.S. Senate seat for some time now. We just don't think she's gained traction. Her fundraising has been weak; she's burned through a lot of it," says Chad Willems, an Arpaio campaign adviser. "A lot of Kelli Ward's support has been on anti-Flake sentiment. I think we will take some of her supporters." Still, Willems says he doesn't expect Arpaio to attack either Ward or McSally. "We're not going to throw the first punch. That is not in our game plan," he says. The 51-year-old McSally – the first U.S. woman to fly in combat, with half a dozen deployments to the Middle East and Afghanistan under her belt – enters the race as a conservative closest to the pragmatic center of the party. But keenly aware of the more tribal and nationalistic makeup of the GOP primary electorate, her campaign announcement video showcases images of McSally in a fighter pilot outfit, touts her past refusal to "bow down to Sharia law" in connection with a military stint in Saudi Arabia, and showcases Trump's praise for her. Though McSally still has not said whether or not she even voted for Trump, the congresswoman, like Ward and Arpaio, wants to be associated with him. "Like our president, I'm tired of PC politicians and their BS excuses," she says in the campaign kickoff video, channeling the spirit of Trump's unbridled language. "I'm a fighter pilot and I talk like one. That's why I told Washington Republicans to grow a pair of ovaries and get the job done." An adviser close to McSally also sees Arpaio's candidacy as severely diminishing Ward's viability. "There's no single voter that is more available to [Ward] today than yesterday. If she's thoughtful, she'll get an appointment to the undersecretary of interior or something. Otherwise, her path to political relevance is extinction," the adviser says. Ward supporters, too, are openly concerned about Arpaio's presence in the race. But they remain wholly opposed to McSally, someone they see as a wolf in sheep's clothing when it comes to promises on immigration. "I find it disturbing that Joe has come along, as much as I appreciate Joe and as much as I understand he got the shaft as sheriff, I'm sorry, he's late to this ballgame.He needs to find another ballgame," says Russell Sias, the GOP chairman of La Paz County, Arizona. "McSally does not have my support regardless. I'm not interested in her at all. Too liberal." J.D. Hayworth, the former congressman who unsuccessfully challenged McCain in the 2010 GOP Senate primary, says McSally's toughening talk on immigration is reminiscent of how he says McCain and Flake would reposition themselves during an election cycle. "The two incumbent senators talked a very good game about border security. If you're looking for a tendency that should trouble Arizona voters, that is one," Hayworth says. "Why trust her? She comes from the wing of the party that has used this as double talk, if not an out-and-out fabrication. Her name is attached to a bill that gives amnesty to the DACA folks. I think open-border folks will flock to her candidacy." In the current debate over an immigration deal, McSally is supportive of an approach that provides an extension of the Deferred Action for Childhood Arrivals program, but only if border security is coupled with it. She's joined with other GOP members to introduce the Securing America's Future Act, which aims to meet Trump priorities for a DACA fix by eliminating a visa lottery and ending chain migration for immigrants' extended family members. The bill's sponsors say the measure provides no special pathway to citizenship for DACA enrollees, who "may only make use of existing paths to green cards." Ward, meanwhile, says there should be no discussion of a solution for children brought to the country illegally "without actually building" Trump's promised border wall. In separate interviews, Arpaio has sent conflicting signals. He said DACA recipients should be deported on NPR, but told CNN he'd probably support the president as a senator if Trump wanted them to stay. It's unlikely any of the three will want to do anything that depicts them as distanced from the president, who remains popular with the most dedicated primary voters. But with the Arizona primary contest on the final Tuesday in August, there's plenty of time for strategies to change and for Trump to decide to weigh in. Watching all of this with likely satisfaction is the sure-to-be-favored Democratic primary candidate, Rep. Kyrsten Sinema, who just announced raising $1.6 million during the last fundraising quarter to bring her total cash account to more than $5 million. "The Arizona Senate race just took an ugly turn," a recent Sinema fundraising email beckoned, citing Arpaio's entrance. But for Sinema right now, the uglier the GOP race gets, the better.